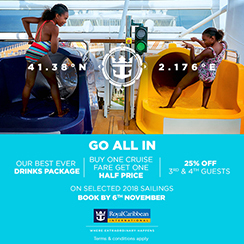 Royal Caribbean cruises and ships are completely designed with families in mind and provide amazing facilities specifically for families. You climb the rock wall, go surfing on the ‘Flowrider’, shoot some hoops on the basketball court or enjoy the mini water park with water cannons, waterfalls, fountains and geysers. Enjoy DreamWorksTM films onboard in the 3D cinema or on the TV in your stateroom. There is further entertainment from the DreamWorksTM characters in spectacular ice shows on the Allure of the Seas, water shows on the Oasis Class ships and the ships parade. Family dining is not a problem on board a Royal Caribbean cruise. You can eat kids friendly meals such as hotdog and fries at Johnny Rockets, eat breakfast with the DreamWorksTM characters from Shrek, and Madagascar or rest assured that children aged 3 – 11 will be served quickest in the main dining room. They can then be collected directly by the Adventure Ocean® Kids Club team while you enjoy the rest of your meal in peace. You can also enjoy cupcakes at the Cupcake Cupboard shop, Ben and Jerry® Ice Creams at the Ice Cream parlour or fresh baked pizzas at Sorrentos family restaurant. Royal Caribbean have created specific family excursions on-shore for all to enjoy including swimming with dolphins, 4x4 driving experiences and much more. Royal Caribbean ships host the Adventure Ocean® programmes to keep your tots to teens occupied all day. There are interactive play sessions for ‘Royal Babies’ and ‘Royal Tots’ from 6 months to 36 months old so kids and parents can play together with other families or for a little extra cost you can drop your little one in the nursery for a few hours where you can rest assured they will be cared for by fully trained members of staff. A babysitting service is also available at extra cost. Teens can enjoy a vast programme of activities including rock climbing, pool parties, movie nights, karaoke and barbecues. There are also teen-only hang outs on board where teens can make new friends and hang out in their own environment with plenty to do including a teen-only nightclub which continues until late. Royal Caribbean have a variety of staterooms for families catering from between four and 16 guests. Each cabin has full bathroom facilities with a shower, TV, telephone and safe. Room service is available 24 hours a day. Royal Caribbean are not the only cruise line to offer family friendly trips though. Check out our P&O family cruises for a selection of itineraries from them.